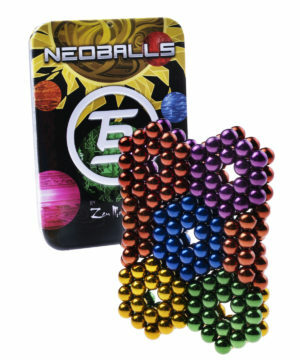 Neoballs: Fun magnetic orbs ideal for building. 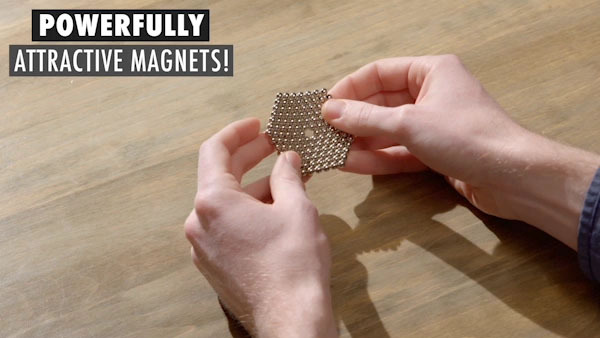 Turn your desktop into a gallery of magnetic masterpieces by building with Neoballs. 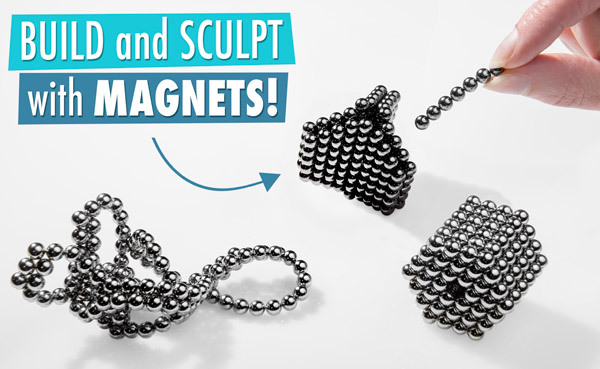 Like their little brother, these magnetic constructors are perfect for fidgeting or as building blocks that snap together. And with their smaller size, you have the flexibility to build even more intricate designs than before. Devote serious time to constructing elaborate structures or absent-mindedly fidget with them while doing other work. You’ll find your fingers being attracted to this curious plaything again and again. 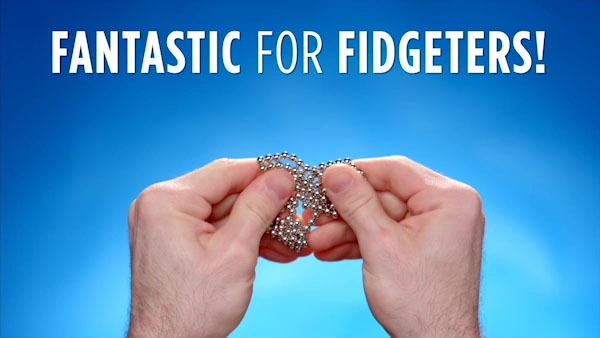 Please note that NanoDots have been rebranded as Neoballs since this video was produced. It's the same product! Neoballs are built for building; they combine strength and flexibility for easy construction. You’ll go ga-ga over how well the orbs fit together, and you’ll be thoroughly impressed with how well they can hold together. The pea-sized neodymium spheres are strong enough to lift 1,000 times their own weight and electroplated for added toughness. Neoballs have spawned an entire online community dedicated to the creation of amazing structures. Dedicated sculptors have made castles, helicopters, and video-game-inspired robots with these little orbs. While making elaborate sculptures requires time and practice, you’ll have fun constructing simpler shapes right out of the package. They’re designed to let you design. Learn to build a TIE Fighter! It only takes one hand to operate your computer mouse, meaning you have an entire hand free to roam your desktop. 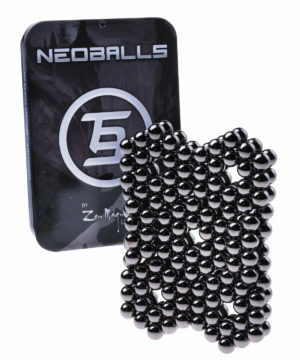 Neoballs make use of that extra appendage to satisfy your fidgeting urge. The dots are fun to roll around between your fingers and to join together with a satisfying clack. Use them to keep your free hand busy while your brain attends to more important matters. Your fingers can’t help themselves. 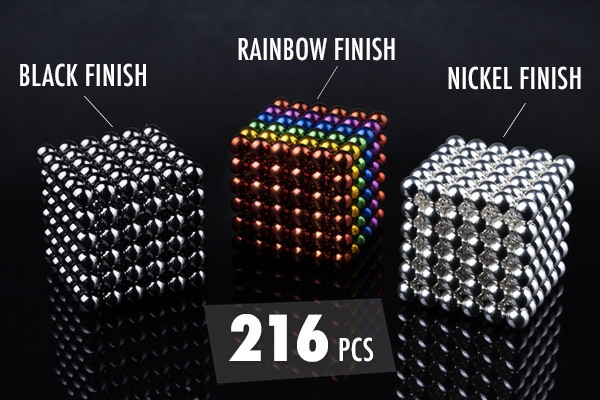 Neoballs are available in an original silver finish, a black finish, and a rainbow assortment that includes five different colors. 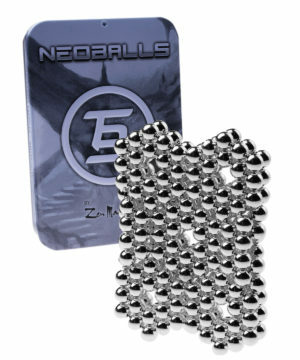 All sets contain 216 Neoballs that can be conveniently carried in the included metal tin. Each set has 216 magnets. Answer: Neoballs, like any small magnet, are only dangerous if swallowed. They should absolutely be kept away from small children and never put in anyone’s mouth. For that reason, the recommended age is 14 and up. 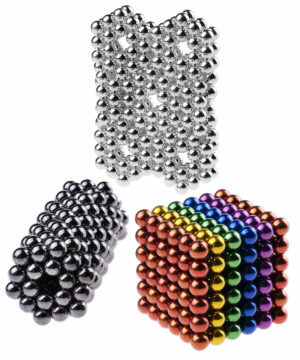 Answer: Neoballs are twice as big as MicroMagnets and three times smaller than Mega NanoDots. Of the three, they are probably the easiest to use for building.